New aircraft are expensive. I doubt anyone will disagree with this statement. But exactly “how” expensive are they and are they “affordable” for Americans? And has their cost in relation to consumer buying power relegated modern GA aircraft manufacturers to boutique aircraft production instead of large scale manufacturing? I think this is exactly what they have become and unless we critically analyze our industry they will remain as such. This doesn’t mean that businesses can’t make a profit when they are structured as boutique producers, but it does mean we aren’t going to see the quantities of aircraft being used as much we see the average household automobile. Aircraft are large consumer goods so in my mind it only seems logical to compare them with other large consumer goods. Consumer ability to purchase large consumer goods is directly related to their income. Nothing I have said so far should be surprising. How affordable these goods are in relation to household income determines if an item is going to be something the “everyman” can afford, or just something the “rich” get to buy, own, and operate. 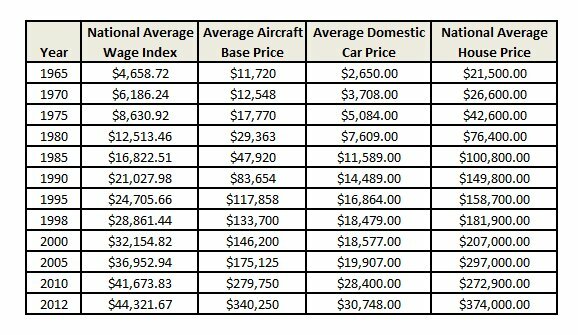 With a little data we can shed some light on how aircraft prices relate to the ability of the average American to afford them. We know that the 1960s saw good numbers of aircraft production, sales, and pilot numbers. This was also in many respects the birth of the modern GA aircraft, when we saw transitions from Cubs and Champs to aircraft that are what many fly today, such as Cessna 172’s and Piper Cherokees. Much of the rest of the American economy also was strong, including other major consumer goods such as cars and homes. These, and aircraft, are large consumer goods about which families think carefully prior to purchase. They are things that to purchase may require saving and they are goods that represent a significant percentage relative to an average household income. I started with a request to friends online if any of them had historical aircraft manufacturers suggested retail (MSRP) prices for aircraft. Specifically, I asked for Cessna 172 and Piper Cherokee/Warrior aircraft since they have been the most prevalent general aviation aircraft over the past few decades, looking for data in 5 year increments to build a baseline. 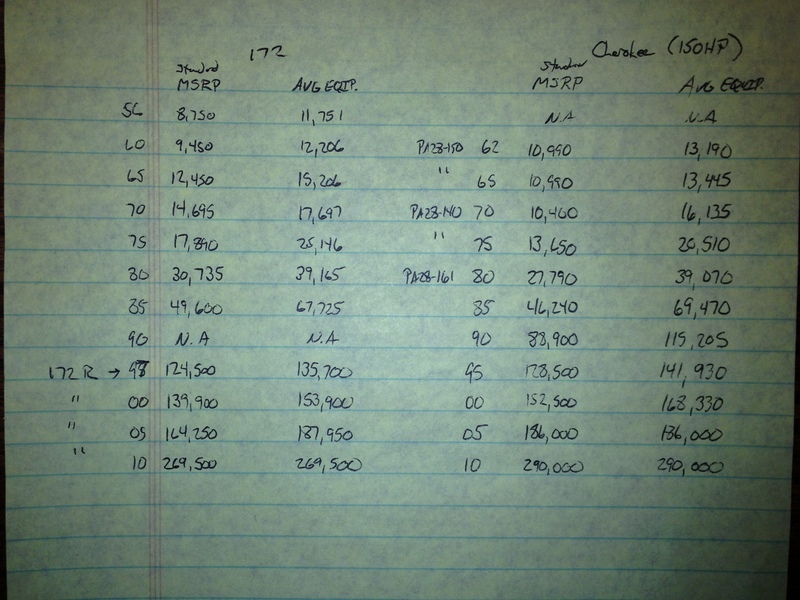 A friend came through with data from an aviation blue book. 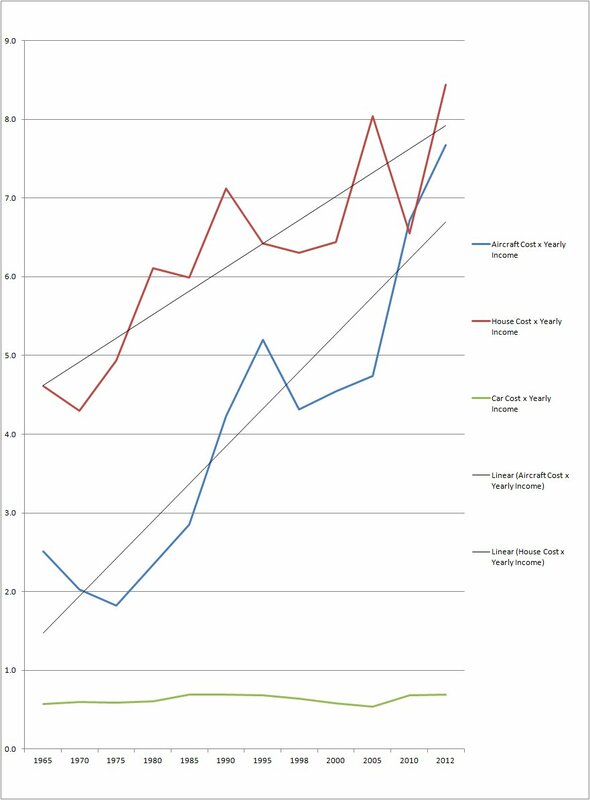 While not every year saw aircraft production for both aircraft models, it was possible to average the airframes and develop a price for each year. Even without comparison to other items, price increases were obvious. And scary. Alone, these numbers don’t offer much perspective. They begin to tell a story when you compare them and how they relate to each other and to the national average wage in each year. We know that prices of all these goods have increased over time, but have they done so at the same rate? The answer is no. New aircraft prices have increased at a greater rate. When we put the numbers in this perspective, we see that the cost of a car has remained approximately the same in relation to national average wage, staying between .6 and .7 as a ratio. A house over the started at 4.6 and increased to a 8.5 by 2012. During the same period, an aircraft went from 2.5, and with some fluctuation slightly down in the 70’s, increased to 7.7 by 2012. This means that a new aircraft, instead of being 2.5 times the average household income was in 1965 now represents 7.7 times the same comparative baseline. Boiled down a little more succinctly, the relative cost of a house increased approximately 22% since 1965, a car increased 83%, and an aircraft increased 205%. The increase in cost for new aircraft is outpacing the costs of the other major consumer goods. When we trend out these data points, we see that the increase in aircraft pricing is at a faster rate. We can argue about why, and there are many reasons, that’s not what I want to do here. I want to focus on the simple fact that they have. Solving why or how to reverse this can be part of a subsequent discussion. If this trend continues, there is no doubt that it will continue to be less likely that most Americans will be able to purchase new aircraft. Some still say that the cost of aviation isn’t the reason for declining involvement. Mathematical relationships such as the ones shown here indicate that those who say this have their heads in the sand. But it doesn’t mean we can’t do something about it. It’s just math, and we can change it. 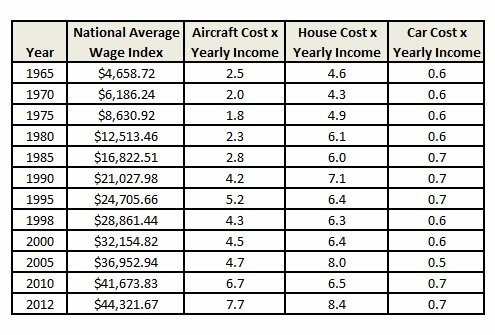 One way to change the math would be to get the national average wage index to match the pace of increase seen in aircraft price. This is probably unlikely. That leaves us with the alternative, we need to find a way to make new aircraft at a price that represents a smaller ratio to annual household income. Finding a way to produce aircraft at lower prices may be able to be done through improvements in the manufacturing process, through economies of scale or a combination of the two. This is business too. We can’t expect manufacturers to just drop prices out of the goodness of their hearts or in hop that “if they build it, we will come.” To be successful, and good for our industry, they also need to be profitable. Our community will need to make it profitable for manufacturers to produce enough aircraft, while at the same time finding a way to make aircraft at a price that is affordable for consumer purchase. Production in mass quantity to achieve economies of scale, new technology that allows aircraft to be produced at a lower price, or some other combination of factors is going to be required. To accomplish this, investment is required, and investment must be justified by consumer commitment to purchase product. Without that commitment the risk is too great for manufacturers. It is very much a chicken and the egg moment. This is no small task. Unless the buying power ration can be changed, aircraft production will remain what it has become, boutique manufacturing. And it means that the used aircraft market is where the majority of the population will look for aircraft to serve their needs. The used aircraft market has been soft and aircraft can be acquired at much lower prices (see the AOPA article from June 1, 2013, “Used Aircraft Values Still Dropping” at http://www.aopa.org/News-and-Video/All-News/2013/June/1/Used-aircraft-values-still-dropping.aspx) These aircraft are available at a much lower acquisition cost but they don’t necessarily have all the whiz bang new features that new aircraft offer without needing significant upgrades (something that comes with a cost). These may not be the average pilot’s dream airplane, but it may be all they can afford. For a while, these aircraft will meet the GA pilot needs, but they won’t last forever. They will eventually wear out. Many of these aircraft have thousands of hours on their airframes already. Moving forward in the future, if we don’t solve the production, price, and buying power relationship problem, we will see our industry continue to contract. This is something about which we need to be realistic. Perhaps as an industry we will come to the conclusion that new GA aircraft will remain a relatively boutique production process, but if we want aircraft production to happen on a larger scale, we have some things we need to think critically about. The used aircraft market is allowing us a little breathing room, some time to decide, but need to take advantage of the time to come up with a solution for the future.